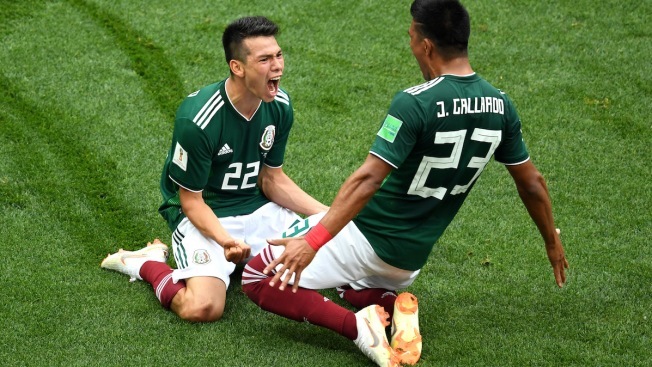 Hirving Lozano of Mexico celebrates with teammate Jesus Gallardo by sliding on their knees after scoring his team's first goal during the 2018 FIFA World Cup Russia group F match against Germany at Luzhniki Stadium in Moscow on Sunday, June 17, 2018. Germany became the third defending champion in the last 16 years to lose its opening match at the World Cup, falling to Mexico 1-0 Sunday. Hirving Lozano scored Mexico's lone goal in the 35th minute, picking up Javier Hernandez's pass inside the penalty area and beating Mesut Ozil before shooting past Manuel Neuer from 10 yards. "I don't know if it's the biggest victory in (Mexico's) history, but one of the biggest for sure," Lozano said. "It's great to start on the right foot when you are playing the world champions." France in 2002 and Spain in 2014 were the other defending champions to lose their opening matches. Neither of those teams advanced from the group stage. Another tournament favorite was unable to pull off a win in their debut Sunday as Brazil managed only a draw against Switzerland. 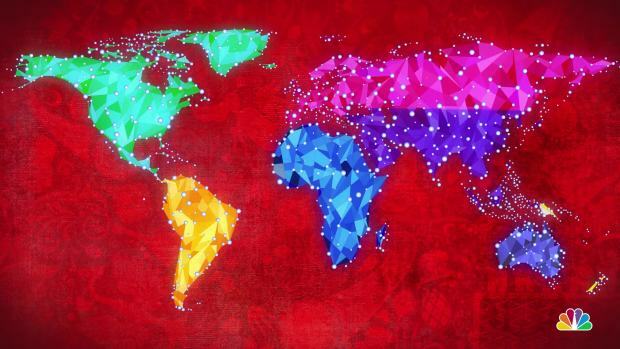 They led 1-0 at halftime thanks to a curling goal in the 20th minute from Philippe Coutinho, and the well-organized Swiss struggled to contain the Brazilian attack led by Neymar and Gabriel Jesus. But Coach Vladimir Petkovic's experienced Swiss side remained composed after conceding the goal, dominating in midfield for long spells and with Ricardo Rodriguez and Xheridan Shaqiri testing the Brazilian defense on the two wings. Then after haltime, Steven Zuber equalized with a header from a corner kick in the 50th minute. Brazilian players complained that Zuber pushed defender Miranda before the goal but Mexican referee Cesar Ramos dismissed the complaint and the score held at 1-1. Earlier on Sunday, Aleksandar Kolarov scored from a left-footed free kick in the 56th minute to give Serbia a 1-0 victory over Costa Rica in their World Cup opener. Kolarov curled the free kick over the wall after David Guzman was handed a yellow card. Costa Rica goalkeeper Keylor Navas, who plays for Real Madrid, couldn't reach it. After a scoreless first half, Navas fought off a barrage of challenges to open the second with the boisterous Costa Rican fans cheering him on at Samara Arena. Mexico nearly gave up the lead minutes after Lozano's goal. Mexico goalkeeper Guillermo Ochoa pulled off a spectacular save to keep the score even, palming Toni Kroos' shot onto the crossbar. The Germans are bidding to become the first team to retain the World Cup title since Brazil in 1962. They hadn't lost an opening game since the then-West Germany succumbed 2-1 to Algeria in 1982. Mexico supporters outnumbered Germany fans at the Luzhniki Stadium and made almost all of the noise, roaring their team forward. Lozano, a 22-year-old forward from the Dutch league nicknamed "Chucky," got Mexico going with a deflected shot over the bar in the first minute. That set the tone for Mexico to torment Germany on the counterattack, with Lozano taking full advantage of right back Joshua Kimmich's tendency to go forward. Seeking defensive reinforcement, Mexico coach Juan Carlos Osorio brought on 39-year-old veteran Rafael Marquez to play in his record-tying fifth World Cup.